Your pool guy would tell you they keep things out of your pool. Your car guy would tell you they keep things out of your engine. Your computational fluid dynamics guy (you have one of those, right?) would tell you they keep things out of your Navier-Stokes equations. And I’d tell you that filters keep things out of your audio signal. Fourier analysis and theory says that a signal (electrical, audio, electromagnetic, etc.) can be decomposed into an infinite number of different sinusoidal waveforms all with different frequencies, amplitudes, and phases. A filter in electrical engineering, communications, audio production, and signal processing is a device that removes, filters out, and/or attenuates specific frequencies from a signal. 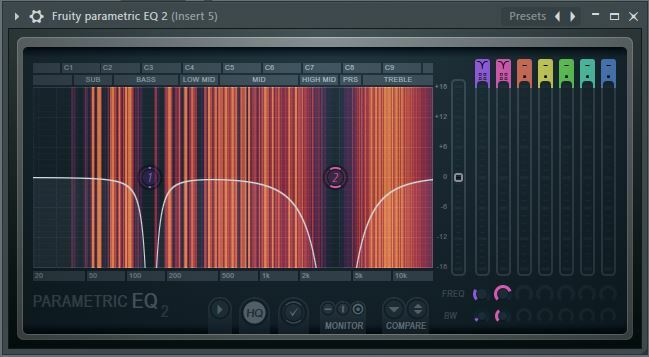 Let’s look at a practical example that we see very often in the audio and music production world: the high-pass filter. This is a filter that removes lower frequencies from an audio signal. 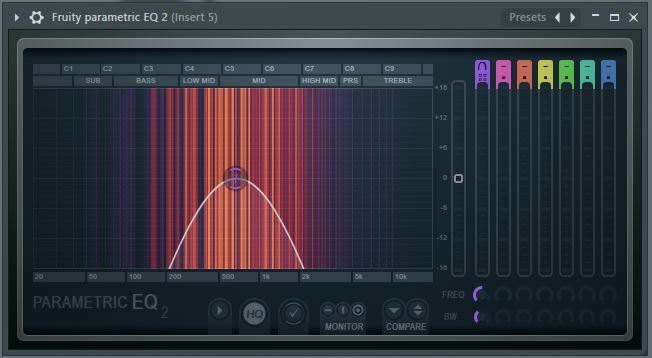 Let’s say we’re mixing a synth that has a very high presence in the low, middle, and high end of the frequency spectrum with a kick. 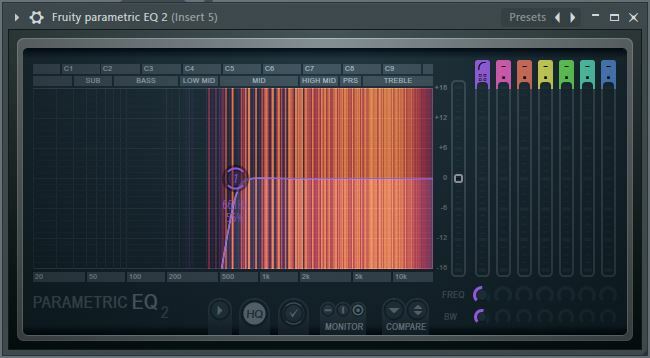 The kick shares part of that low end with the synth, and the kick should be a very prominent feature of the track. So, one viable solution is to apply a high-pass filter to the synth to remove some of it’s low end presence and make room for the kick. Very useful! Let’s run through some of the terminology you’ll see when talking about filters. This is also known as filter cut, or just simply cut. With high-pass and low-pass filters, it’s the frequency that beyond which all other frequencies get cut out or attenuated/suppressed. 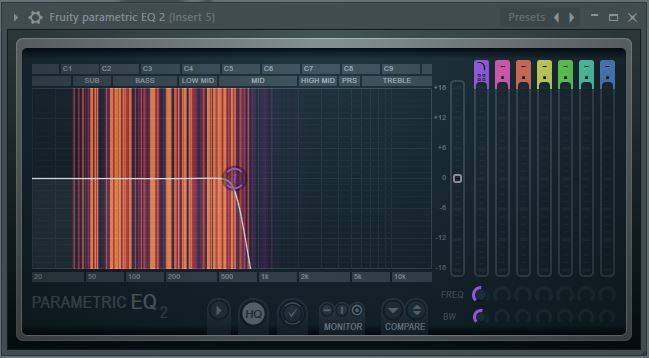 Let’s say you’re using a high-pass filter like in our example above and have set the cutoff frequency to 170 Hz. Then, all frequencies below 170 Hz will be blocked out or suppressed, and everything above 170 Hz will pass through the filter. This is why we call it a high-pass filter, because it allows high frequencies to pass through. A spectrum analyzer showing a synth running through a high-pass filter with a dynamic cutoff frequency and resonance. The filter is removing everything below the cutoff from the signal. Filters are not always perfect. They can let a portion of the signal beyond the cut-off frequency through. In the case of our high-pass filter example above, you can see that some of the signal is “leaking by” past the cutoff point near the steep slope. We call that slope the roll-off, and it represents the rate of change of the filter’s attenuation/suppression of the signal. You can have a very steep roll-off like the example above, or a more gradual and gentle roll-off. It all depends on how much of the signal you want to let past your cutoff frequency. Some filters change the phase of some of the frequencies in a signal more or less than other frequencies as the signal passes through. In other words, the relationship between phase shift and frequency is non-linear. We call this phase distortion. A way around this is to use a linear phase filter, which alters the phase of all frequencies passing through the filter the same amount. There are tons of different filters for all types of applications. Let’s run through the most used ones and look at visual examples. You should already have a good idea of what this one does. Again, it let’s higher frequencies pass, and suppresses or blocks lower frequencies. A high-pass filter with no resonance applied and steep roll-off. Cutoff frequency is 661 Hz. These are the exact opposite of high-pass filters. They let low frequencies through and block or suppress high frequencies. A low-pass filter with no resonance applied and steep roll-off. Cutoff frequency is 661 Hz. A band is simply a range of frequencies in the spectrum. And a band-pass filter lets only a certain range of frequencies though. For band-pass filters, we call this range the passband. We define width of the passband (bandwidth) by what we call the filter’s Q factor. A band-pass filter centered at 661 Hz. Resonance is not applicable here. This one lets everything through except a certain range of frequencies, called the stopband. It is the opposite of the band-pass filter. We also define the width of the stopband by the filter’s Q factor. We call a band-stop filter with a very high Q factor, which makes the stopband very small, a notch filter. A notch filter (point 1) centered at 150 Hz and a band-sop filter (point 2) centered at 3762 Hz. Resonance is not applicable here. This allows all frequencies to pass through, but modifies the phases of the signals component frequencies. When the original signal gets mixed with the signal that’s been passed through the AP filter, it creates destructive interference and phase cancellation. This is basically the same thing that a phaser does. And that about sums it up for filters. If you liked this write-up, let me know what else you’d like me to cover in the comments or on the Synaptic Sound Facebook page!